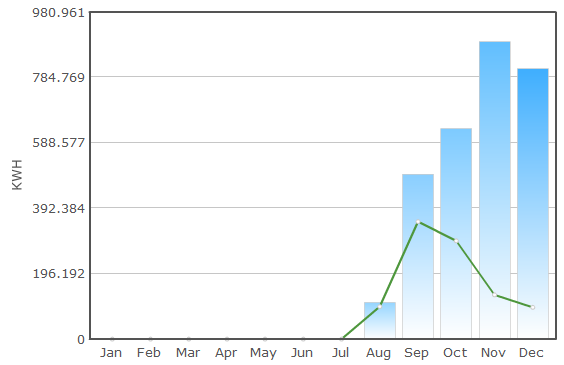 On this, the shortest day of 2011, I mark a third of a year since my solar panel installation. Solar PV has been in the news in the meantime because the government made a fairly dramatic U-turn on the FiT (Feed in Tariff) on the 31st October, announcing that only systems registered before the 12th December would get the then established rates of payback for the full 25 year period; all systems registered after that date would see the FiT almost halved depending on the size of the installation. Just yesterday the Friends of the Earth and a couple of installation companies managed to obtain a high court ruling that this change was unlawful as the government hadn’t finished their consultation on the matter, so we shall see where this goes! The government claimed that the FiT scheme had been so successful that it had brought down the cost of installations to the point where they are far too profitable. They wanted payback to take about 16 years, but reckoned some systems would payback in only 8 years. Fortunately for me, my solar system has been registered well within the approved period, so unless the government breaks their existing agreement, I’m tied in to the more favourable rate of payback for the next 25 years. Time will tell as to how long it’ll take to reach payback! My wonderful Wattson energy monitoring system has been measuring both our consumption and generation since the PV system was installed. In the graph below, it should be noted that the values for August and December are not complete, as the system was brought online late on the 23rd August, and the last measurement was uploaded yesterday morning. The blue bars are our consumption, and the green line is our solar PV generation. I’m pleased to note that in the final week of August, we very nearly generated enough power to meet our needs – hopefully that’ll be the case in from May to August. Our consumption has increased month on month due to the fact that a part of the house (a north facing extension) is heated by electric storage heaters, so as winter has drawn in it has been necessary for us to put a lot of energy in to keep us warm. The remainder of the house is heated by gas fired central heating, which isn’t included in our consumption here, but we need to use that surprisingly little – my theory here is that a combination of a heated northern edge and the heat from kitchen appliances goes a long way to maintaining a comfortable temperature. Another key change in our consumption has been caused by the arrival of our daughter in mid-October. Suddenly we need to run bottle warmers, sterilisers, and electric heaters on cold nights. Also we bath her nearly every night, and as our water is heated overnight we generally need to run the booster immersion heater for 15 minutes or so every evening – something we rarely used to do. On the other hand, when compared with the same period last year, our consumption is well down. This is partly due to a milder winter so far (we had snow twice by this time last year! ), and also due to the solar generation offsetting our consumption. These two factors are reasonably easy to separate as our night readings are down 40% (milder winter) and our day readings are down 54% (due to solar PV assistance), causing an immediate saving in outgoing bills before the generation payouts listed below are taken into account. Generation has faded as I’d expect as we slipped into winter. Given an even spread of cloud throughout the year I’d expect the green line to be roughly sinusoidal, with a peak in June and a trough in December. On the 23rd November I submitted my first quarterly generation reading: 817kWh. There’s an agreed 3.1ppkWh export payout, plus the 43.5ppkWh FiT. The trouble is there’s no export meter – when we are generating more than we are consuming my consumption meter simply stops, so there’s an assumption that we use half and export half of what we generate. I’m therefore paid (3.1/2)+43.5=45.05ppkWh, so was pleased to receive my first cheque for £366.42 this month. If every quarter gave an identical yield (which of course they won’t), I’d achieve payback in a little over 8 years. Nice. Perhaps though things are even more optimistic: the majority of that quarter was actually winter-side of equinox, so it should be below average. Time will tell – perhaps the government were right to make a hasty change after all, although I am inclined to suggest that 6 weeks notice wasn’t at all reasonable on both prospective consumers and those businesses that had cropped up around this industry. It’s looking good isn’t it. My parents’ 4kw system isn’t doing much this time of year either. But since March it’s generated about 3800 kWh which I think translates to about £1500.